Embrace the wonder of nature with one extraordinary man's chronicle of living alone in the Alaskan wilderness. 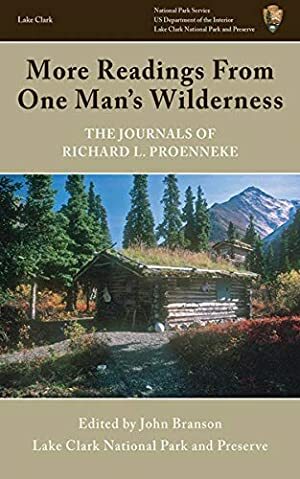 Often called a modern-day Thoreau, Richard Proenneke took up residence in a small cabin he built in Twin Lakes, Alaska, in 1968, and spent the next thirty years living alone there, observing the natural environment and making his life a part of it. His journals, countless reflections about his existence there and the majestic beauty of the land he called home, were given to the Lake Clark National Park and Preserve when he finally left Alaska in 2000. During his years in Twin Lakes, Proenneke had a front-row seat to the great land debate that raged through Alaska in the 1970s, and he was witness to the creation of a four-million-acre national park. His thoughts have been edited here to include notes, maps, and biographical information about the man who wrote them, preserving an amazing legacy of one man's dedication to communing with nature. Log In to track John Branson on eReaderIQ. to be notified each time the price drops on any book by John Branson. to stop tracking John Branson. We started tracking this book on March 6, 2012. The price of this book has changed 117 times in the past 2,602 days. The current price of this book is $10.77 last checked 7 hours ago. The lowest price to date was $1.99 last reached on January 29, 2019. The highest price to date was $13.29 last reached on June 7, 2014. This book has been $13.29 one time since we started tracking it. We last verified the price of this book about 7 hours ago. At that time, the price was $10.77. This price is subject to change. The price displayed on the Amazon.com website at the time of purchase is the price you will pay for this book. Please confirm the price before making any purchases.